The county has told the public for years the county has no money for roads. The county has spent over 3 years focusing on transportation. The commissioners felt the transportation issue was so critical they created the Transportation and Economic Development initiative and the Transportation Policy Leadership Group in March 2013. The county handed crony consultants $1.35 million for a phony Go Hillsborough campaign to sell another huge sale tax hike. 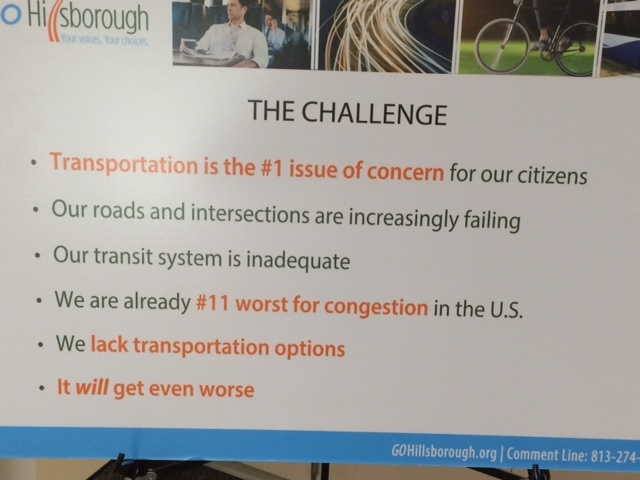 The county fed the media and public that transportation was the #1 issue in the county. The county's actions does not match their own rhetoric. Since 2013, commissioners have put aside at least $115 million to build new parks and recreation centers, launch incentives for historic preservation and the film industry and provide assistance to local museums and charities. Our local roads, the county's largest asset, has the biggest funding gap and the commissioners know that. However, the commissioners continued funding lower priority wants over funding our local roads and transportation needs. Our county is rapidly growing again with new construction getting added to the tax rolls, our housing values going up again and more people working with our unemployment rate now at 4.2 percent. However, the county held our local road funding hostage refusing to fund the county's largest asset. The county refused to re-divert our growing property tax revenues that historically always funded our roads back to funding our roads and transportation needs. The county had over $100 million of new revenues for FY2016, including between $40 and $50 million of new recurring revenue and the $23 million one-time BP oil spill settlement money, but no money for roads. But as county revenues rebounded, transportation spending remained relatively flat. Meanwhile, commissioner spending jumped from $9 million in 2012 to $38.5 million in 2013 (emphasis mine). Instead of funding the county's highest priorities first, the county preferred to spend on "wants" not "needs". No one else can manage their budget in this manner and neither should the county. Reality is the county has not been honest brokers about our budget. But Hagan defended the most expensive park on the list: the Brandon sports complex. He said the park, a public-private partnership with Tampa Electric Co., will draw national youth tournaments and should eventually generate revenue for the county. "There is some merit to that logic" of cutting back on commissioner priorities, Hagan said. "But you need to balance transportation needs with all of our needs and services." Since when did funding new expensive parks become a need? Especially when the county refuses to fund and maintain a primary responsibility of local government, our local roads, that 98% of us use everyday. The TBT list of spending projects is just the tip of the iceberg. The Times does not begin to mention all the money the county has spent on studies, consultants, nebulous economic development projects, subsidizing special interests and handing millions of our tax dollars to millionaires and billionaires. The commissioners are elected to make tough decisions. They should be providing disciplined oversight of our growing county budget to ensure the county is funding it's highest priorities first. The commissioners have oversight responsibility not the unelected bureaucrats. When the commissioners stop pursuing an unnecessary sales tax hike and start focusing on our existing budget to fund our roads and transportation needs, then we will know that transportation is truly the county's #1 issue. 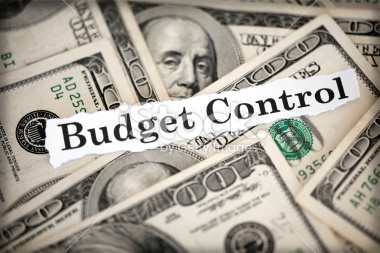 We need budget control now before the county ever asks taxpayers for a sales tax hike! Excellent article! This egregious performance by our commissioners in fiscal stewardship does not include the extra $1 million spent by the County Administrator to hire the help needed to do his job while he was off fooling around with leading the effort to get a tax increase referendum passed. This is a political activity which is specifically prohibited by our county charter and yet, the Commissioners directed him to do it! The Charter is built to prevent political activity or policy-making by staffers who do NOT have the authority which can come only from the ballot box. County Commissioners do NOT have the authority to supercede the Charter. That takes a referendum! Great article. The fact is that they are incapable of prioritizing where the money goes and lie about what is left. This is unforgivable. This is no longer an issue about a sales tax , but about a local government in the state of Florida lying to its people. This has to stop here.